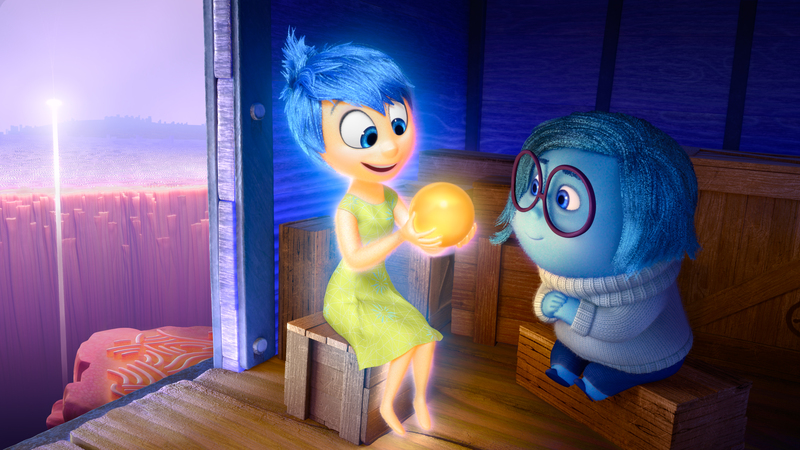 Inside Out is a delight, a terrific Pixar treat. Just like Toy Story, Up! and Finding Nemo, it’s an exciting, visually inventive and narratively complex story that will appeal to children and adults. The story weaves supposedly accurate neuroscience into the adventures of 11-year-old hockey lover Riley and her parents who, after a move with unexpected complications, have to deal with their emotional reactions that leave their family skating on thin ice. Inside Out , like Up! , presents universal truths that will resonate if you want to pay attention. At the show I attended, the four year olds were enthralled by the fast-paced animation, the eight year olds were beaming at the saga about a regular kid, the twentysomethings thought it was profound, and a thirty-year-old dad told me it would help him be a better parent. This really is a great family movie. If you’ve followed the PR blitz, don’t let the neuroscientific hoo-ha discourage you from having a good time. 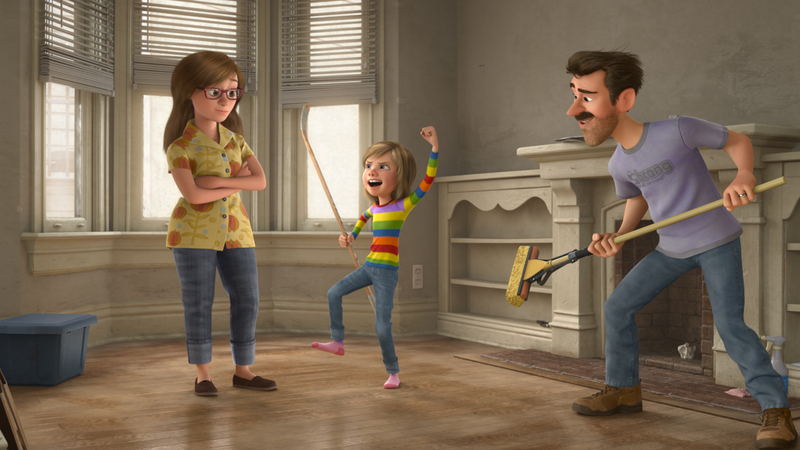 The mostly sensible scientifically-based premise of Inside Out is that our basic emotions, represented in the movie by colorful and adorably shaped emoticons, share space in our psyches and are often in competition with one another. We act the way we do based on how we regulate their activities. When we accept that all of our emotions need to be felt, validated and expressed, we are better equipped to cope with the ups and downs of real life. Great stuff! As the movie begins, 11-year-old Riley’s inner emoticons are in a state of confusion. Up until now, the pretty and perky Joy has been the queen bee, and other feelings Anger, Fear, and Disgust have been second-class wannabes. The adorable Sadness, who makes Charlie Brown look like a motivational speaker, has been the reject of the group. Riley has had a blissed-out life until she moves from Minnesota heaven to the bleak harshness of San Francisco. Yes, as we all know, San Francisco can seem gray and gloomy compared to Minnesota. Riley just can’t cope. Her perky, giggly optimism fails her when confronted by this alien new environment. Some aspects of her life in the city by the bay would deflate anyone’s balloon: her shabby and barren Victorian house; the local pizzeria that serves only pizza with broccoli on top; the school that looms over a prison-like yard. (I wish that she didn’t seem equally put off by the children in her class whose varying skin tones are in contrast to those of her playmates back in Minnesota.) But is the problem for Riley that San Francisco is grim, or is it that she hasn’t learned that life sometimes includes disappointments? Riley may have had a charmed life in Minnesota, but I think it’s worth noting that she was born with an easygoing temperament that helped her to skate along when there was little to stress her. Temperamental qualities emerge early in infancy and are determined by genetics. In the movie, we see Riley as a baby who smiles easily, enjoys new experiences, is active and coordinated, and is easily distracted when she fusses. Riley’s parents simply go with her natural tendencies and respond to her occasional negativity by cheering her up with funny faces and jokes. Sadness, when it creeps in, is pushed away quickly. In real life, these inborn qualities can be supported by parents, but this is nature, not nurture, as any parent of a child with a more challenging temperament knows. 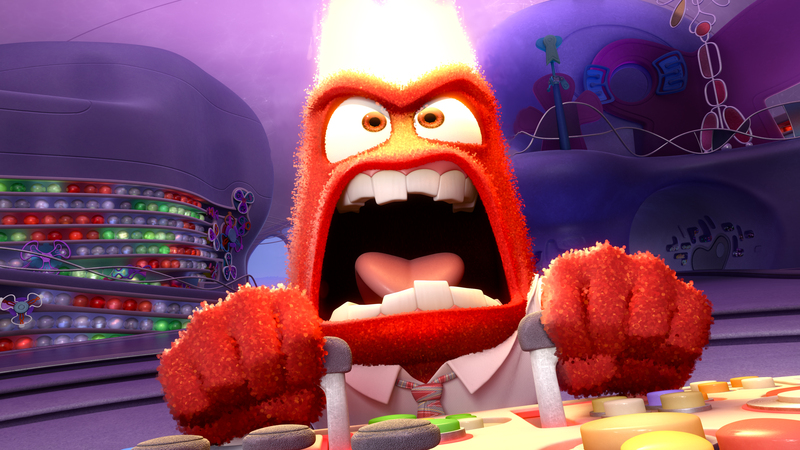 Inside Out – Pictured: Anger. ©2015 Disney•Pixar. All Rights Reserved. When Riley moves away from her comfortable and familiar home and even her kindly parents are challenged by their circumstances, neither she nor they know what to do with their uncomfortable feelings. Mom and Dad want Riley to put on her usual smile and keep the grown ups happy. They want to jolly away her losses, and barely notice that she is expressing sadness and anger, because they’ve been helping her to push those feelings away all of her life. Like a lot of loving but misguided parents, they’ve sent Riley the message: Don’t be sad, don’t be angry, don’t have all your feelings, just the ones that we can handle. So when Riley can’t hold her disturbing feelings in, and her parents don’t acknowledge or accept them, she has no idea what to do. She becomes irrational, illogical and impulsive, just like most people who are overwhelmed by unfamiliar emotions. 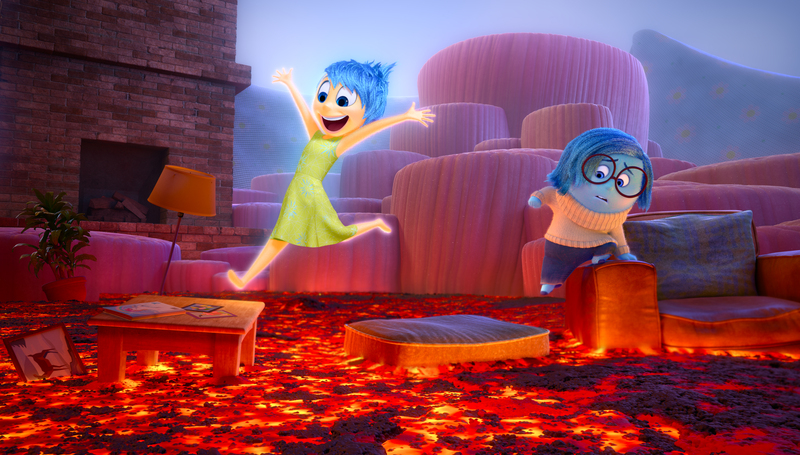 Inside Out – Anger, Fear, Joy, Sadness and Disgust look out upon Riley’s Islands of Personality. ©2015 Disney•Pixar. All Rights Reserved. Most of the action of the movie comes when (in a confusing segment) Sadness mixes up the inner mechanics of Riley’s emotional regulation “headquarters,” resulting in the loss of Riley’s “core memories” that power her “personality islands.” This is a silly pseudo-scientific concept that justifies the odyssey that will provide most of the action of the movie. The quest is exciting and hilarious and I was having too much fun to make sense of it all even when I tried. It really doesn’t make any difference. As with all great quests, the leader, Joy, with her newly acquired sidekick the snuggly Bing-Bong, and the tag along Sadness show courage and creativity on their entertaining journey. Along the way, everything changes when Joy discovers that Sadness really has an important role on the team. 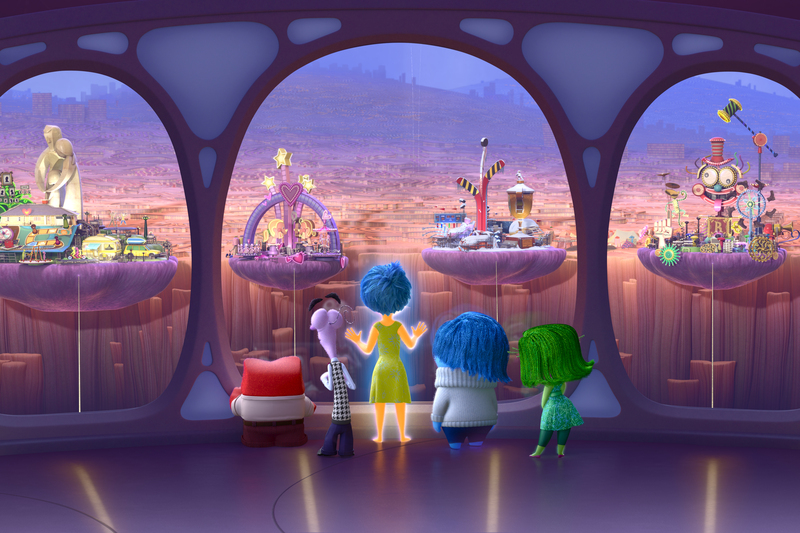 Inside Out– Joy and Sadness navigate through Imagination Land. ©2015 Disney•Pixar. All Rights Reserved. So there’s the message. Joy and Sadness must go hand in hand on their journey and in life. Will a young child “get it”? Maybe, but who cares? The movie is sweet even when it’s sad, generous when the characters make mistakes, and doesn’t pander to peril. (I was a little nervous when Riley began her own odyssey to Minnesota at the seedy bus station, but like all plucky heroines she was unscathed.) I asked an eight year old at the screening what she thought the movie was about, and she said, “It’s about all the things you can do in your imagination.” That’s good enough. Joy (voice of Amy Poehler) and Sadness (voice of Phyllis Smith) catch a ride on the Train of Thought in Disney/Pixar’s Inside Out. 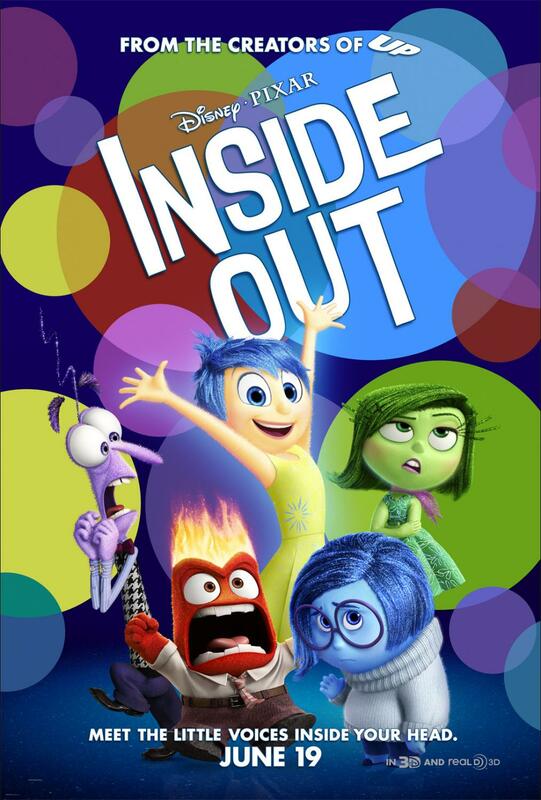 Directed by Pete Docter (Monsters, Inc., Up), Inside Out opens in theaters nationwide June 19, 2015. 2014 Disney/Pixar. All Rights Reserved. In my work, I help children learn to notice their feelings, to use words to express them, and to understand that even when a feeling lasts a long time, it won’t hurt you. They learn that breathing, using their imaginations, and connection with others will help them get through emotional tough times. These aren’t easy concepts—who wants to hold on to sadness and anger? But feelings on the inside can’t just be pushed away, as Riley and her parents learn. They need some time, attention, and acceptance. As we allow ourselves to sit with sadness, anger, fear, or anxiety, we learn to be OK with life. And that’s why I have just ordered a few Pixar-licensed stuffed emoticons to use with the children I see. Sadness and Anger will arrive on my doorstep tomorrow. I’ll let the kids show me what their version of Joy looks like. is now playing in theaters nationwide. 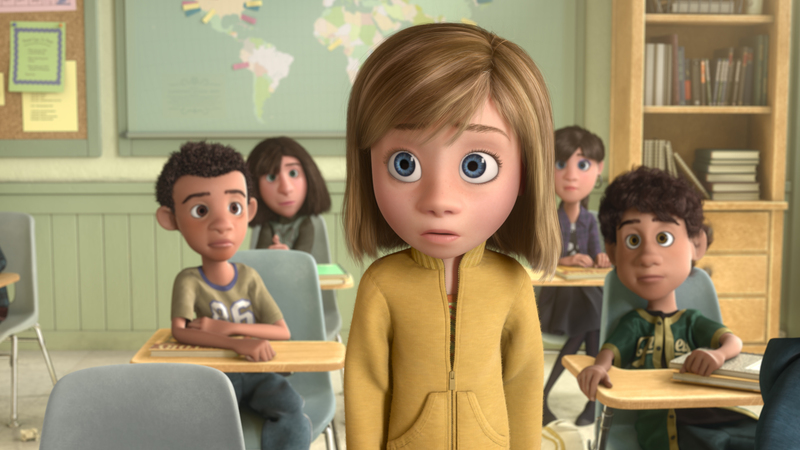 Inside Out is equally enjoyable in both 3D or flat. We think the best presentation in the Bay Area is at Oakland’s Grand Lake Theatre where the brightness of the 3D screenings is double other theaters because they use two projectors. It is the favored venue of Pixar animators. Meg Zweiback RN/CPNP counsels parents and children in Oakland, California. She specializes in teaching children emotional self regulation and helping parents to understand, accept and manage their children’s behavior. She built her family consultation practice, helping parents with what she calls “Solutions for Everyday Life With Children.” Many call her call a “Parent Coach” and others call a lifeline to sanity! 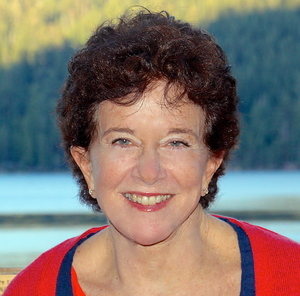 Meg is the author of four books for parents, has been a radio columnist, a media commentator and is Contributing Editor and writes a monthly column in “Parents’ Press,’” where she has been a Awarded “Best Columnist” by Parenting Publications of America. She posts advice for parents at www.bringingupkids.com. 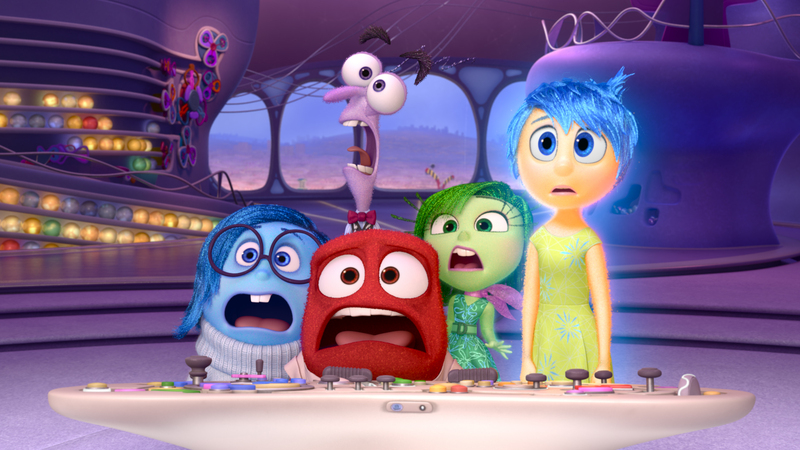 This entry was posted in Films, Films: Reviews and tagged Inside Out, Meg Zweiback, Pixar. Bookmark the permalink. ← Eat My Shorts: It’s Time to CHANGE THE TUNE!